1. Will my cargo reach the warehouse on a timely schedule? Answer: Yes. Our warehouse facility in Edison, New Jersey at Raritan Center is serviced by the Raritan Central Railroad with direct service to all major railroad services. Railroads are also far less affected by bad weather, accidents and similar delays that would tie up the average over the road truck driver. Provided that there is a steady shipping flow from your manufacturer, there will be regular arrivals at the warehouse for offloading, storing & shipping to the customer. Though we can’t control the weather or natural disasters, the vast majority of shipments happen in a timely manner with no change to schedule. 2. Will my cargo be damaged en route to warehouse due to the constant moving of the rail car side to side & forward to reverse due to stopping & going? Answer: No. When something is shipped in a truck, it receives the same amount of motion, vibration and shock with no damage, provided that sufficient packing materials are used when preparing your cargo for shipment. When you are shipping your cargo, make sure the proper dunnage, air bags, blocking and bracing (which ever you prefer) are applied to minimize any type of damages due to constant movement of cargo. Because we have extensive experience in the transportation industry, you can rest assured that your shipment is being properly loaded and secured while en route. 3. Are warehouse personnel trained on how to properly unload rail cars? Answer: Yes. We have over 40 years of expertise and experience in public warehousing, import & export logistics, rail service and freight transportation, and it shows. Our new warehouse personnel are mentored by senior workers as part of their training when they start with the company. The senior workers spend their days unloading & loading rail cars constantly, giving them the experience and expertise they need to take care of your cargo while it’s in our capable hands. We have strict policies in place that all new personnel be given extensive training and real-world experience prior to being left alone to unload rail cars without additional supervision. 4. Is there a cost advantage utilizing rail box cars? Answer: Yes. A rail car can hold significantly more than a truck, so though the price seems higher at first glance, you will actually realize significant cost savings. One rail car can hold the same amount as three and a half trucks while using far less fuel overall. In addition, tracking your cargo shipments is also easier, as you’re only tracking one shipment instead of four separate truck loads. You’ll find our rates very competitive when you take this consideration into mind. In addition, with our economy on the upswing, there are fewer experienced over-the-road truck drivers, so your shipment may well be safer if you send it by rail, saving you from spending your precious time filling out insurance claims. 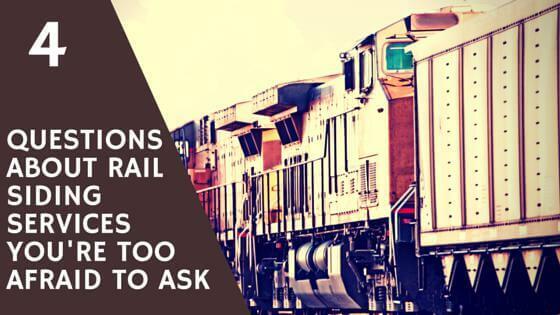 Now that you know the advantages and answers to how rail siding services can meet your cargo transportation needs, why not take the next step? Contact us for details on setting up service, how to plan for your rail siding services transportation needs and for any other questions you need answers. We’re always happy to help, even when you’re afraid to ask.